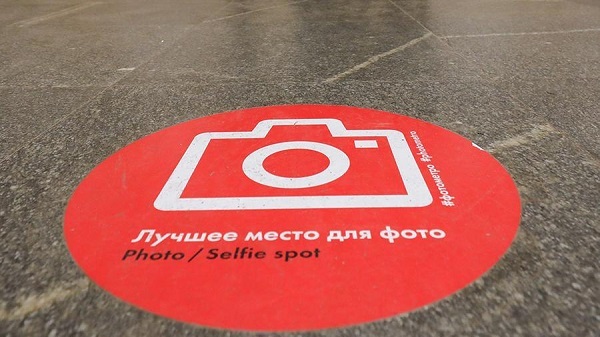 The most successful places for selfie in Moscow are designated with special stickers for the 2018 World Cup. The website of the mayor and the government of the capital reports this. So, the best places for pictures will be noted at nine Moscow stations and MCC. On green stickers in the form of cameras with emoticons will be written: "It's allowed to take photographs." They will be placed in the waiting room, on the platforms, station areas, in business zones, the press service of the Moscow Railway said. The action is timed to the World Cup in 2018, which will be held in Russia from June 14 to July 15. Its goal - the popularization of amateur photography, reports RT. In addition, thus, passengers want to remind that the first good picture can be made immediately, having got off the train. For example, many MCC stations are located within the historical Moscow, where you can find a suitable angle for a photo. Fans of the World Cup in 2018 have already booked more than 74% of seats for free trains. In total, at matches of the World Cup 2018 in Russia not less than 600 thousand fans are expected.